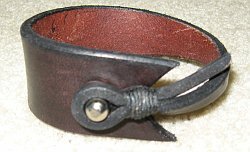 Our tapering harness post wristbands are equally popular for men and women in any of three widths: 1/2″, 3/4″ 1″. 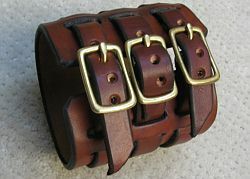 They can be made in black or brown leather, with nickel or brass harness post. They are $24 each. 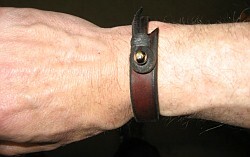 Be sure to include your wrist measurement when ordering one of our wrist bands. Shipping is $4.95 priority mail anywhere in the US up to $50. 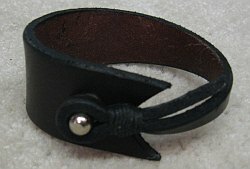 I made our classic 3 1/2″ wide 3-Buckle Wristband that in the 60’s and early 70’s. My friend, Sean Whelan made them in the late 70’s, 80’s, and 90’s. As a tribute to Sean, we are making them again. 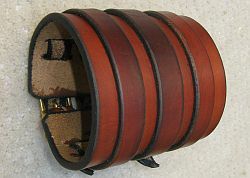 Price is $160. for a pair, or $89. each. 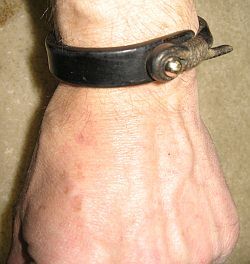 Specify wrist measurement at wrist, and arm measurement 3 12″ up from wrist. Our soft braided wrist bands are $15. each. 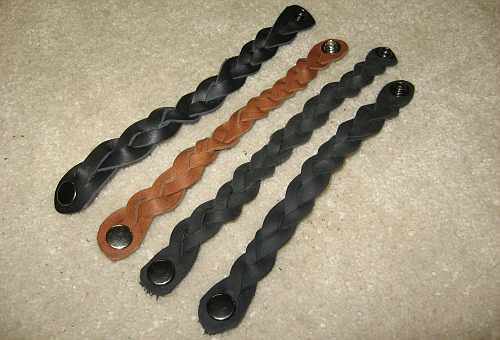 They come in Black, Brown, Brandy, Natural, Red, Purple,and Green and have a snap closure.